Ficus religiosa, the Bodhi Tree, or Bo-Tree, Sacred Ficus, is a sacred tree to both Hindus as well as Buddhists. It is the oldest depicted tree in Indian art and literature. There is a veteran tree in Bombay which is about 3000 years old. It grows up to 30 meters tall with a trunk diameter of up to 3 meters. It is a species of Banyan native to India, southwest China, and Indo-China east to Vietnam. 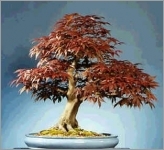 You can grow it as a great bonsai. When the leaves first appear their colour is red-pinkish, but then they turn deep green and grow to about 12 to 18 cm long. They are attached to long flexible stalks, which makes them rustle, flutter and dance in the slightest whiff of wind. The foliage can often be dense. The pendant leaves of this Fig tree are heart shaped. The tree becomes leafless for a brief period in dry habitats. The trunk has smooth grey bark and with age this trunk becomes irregularly shaped. The bark can have brownish specks and peel off in irregular rounded flakes. It will eventually produce aerial roots which grow down to and into the ground where they form new rooted trunks. 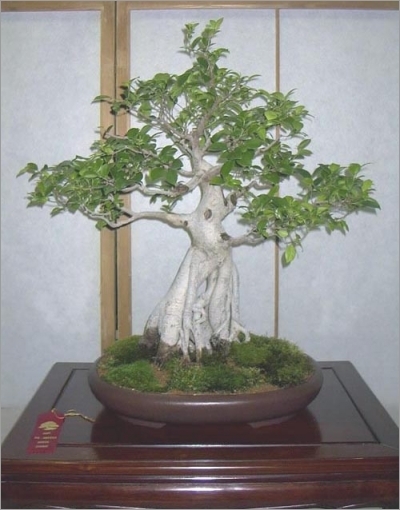 It is also grown as an ornamental, or bonsai and can be kept pruned to the desired height. The small red flowers appear in February. The tree fruits in May/June and bears a small flat-topped figs 12-13mm in diameter, which appears in pairs on the twigs. They are green at first and ripen to a blackish purple. The fruiting tree becomes a treat for many different birds and animals.